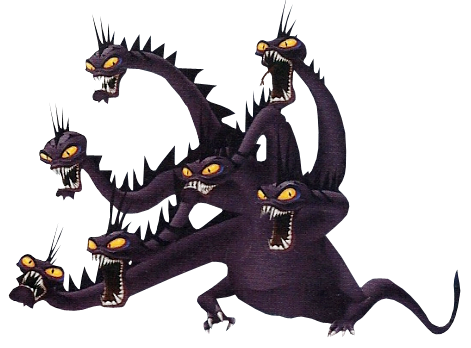 A bloodthirsty monster with several heads. It was sent by Hades to the Coliseum to fight Hercules, but was left alone when the Hero thought mistakenly he defeated it. Having cut its head off, it grew two back and destroyed the Coliseum in Hercules's absence. It was a gruesome battle, but eventually Sora managed to lock away all of its heads, thanks to the combined efforts of everyone in Olympus.